The wide width of the Plaid Ribbon makes this a Decorator's favorite! 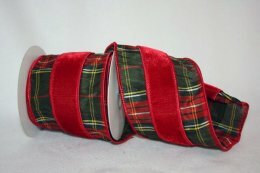 Decorative Christmas Plaid Ribbon from The Ribbon Diva gives that decorator’s touch to your Christmas trees, wreaths, home décor & Christmas gift wrapping. ....Please select Combo 1 Combo 2 .